Description: These 700c clincher wheels are the ones you want to beat around town with, tackle the traffic with on your daily route or hit the velodrome with on Saturday night. The double walled rims have machined sidewalls suitable for brake use if desired. Both wheels use forged alloy hubs with super smooth and fast sealed cartridge bearings. The rear hub comes with a steel 16t cog and lockring. The rear hub also allows for a threaded freewheel on the opposite side. 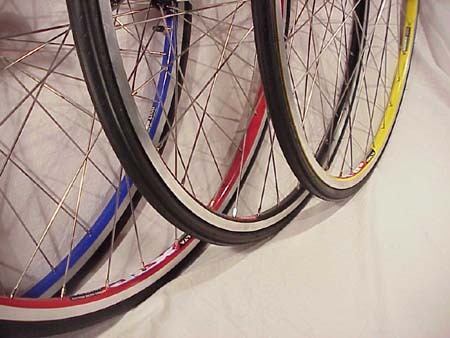 These 36 hole rims are fitted with Stainless steel spokes and come with tires and presta valve tubes already installed. Tires and tubes are factory mounted but not fully inflated and the cog and lockring are on hand tight. Axle Nuts: Stainless with built in rotating washers. Spacing: Front - 100mm , Rear - 120mm plus two 5mm spacers to get 130mm if desired.